What propels an artist to manipulate threads, transform tiny pliable strands into a personal statement of social concern? Fiber Art, the chosen language of the artists in this exhibition, carries with it an involved social history that allows the artist to communicate through familiar associations and materials. The viewer begins his understanding with comfortable reference points. These ten artists use Fiber both openly and subversively to seduce and engage us, juxtaposing the sensual beauty of texture and form with layered social content. The ensuing dialogue--on issues of domesticity and environment, spirituality and isolation, language and immigration, oppression and violence--demands our total, even sensory, involvement. The tension thus created in these visual renderings speaks of the complications/lamentations of modern society, and brings us to a space where we are forced to confront both the luxuries of such a culture and the price we pay for them. 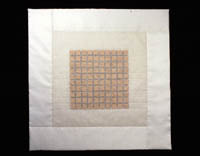 Linda Hutchin's work involves the existential questioning of permanence and constraint versus spiritual freedom. What exactly is the role (roll) of bread -- religious, nourishment, cultural fairytales? Can wire restrain it? Does a plastic "caution" tape physically limit us? In her mixed-media installations, Hutchins demonstrates with humor how everyday objects (including that lamentable symbol of our violent society) are lifted into the realm of fine art. 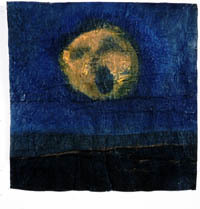 She not only challenges the boundaries which society draws for us, but also the assumptions of her own tapestry medium. Confrontational, yes, and always contrasting futility with hope. Susan Taber Avila's art "
Akemi Nakano Cohn struggles with two cultures as she states, "There is a tension between the Eastern values with which I was raised and Western values to which I am adjusting at present." 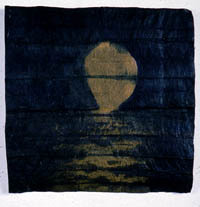 This tension is clearly present in her complex imagery and contemporary color palates that contrast with her adherence to traditional Japanese dyeing methods, especially the Nassen paste resist techniques. Her multi-layered constructs mirror the depth of her personal experience. (See more of Cohn's work in our Gallery archives, "Interpreting Japanese Aesthetics". Kyoung Ae Cho, a South Korean artist, brings nature's life cycle to view through her powerful organic sculptures and quilt-like assemblages. Clearly inspired by the beauty of the process itself, she decorates the surface with materials taken from nature, such as pine needles and bark. But then she reworks them to address her concern with human intervention--the natural rhythm and geometry of Mother Nature has been interrupted by human contact and the results are profound. Katherine Westphal, California's legendary Daughter, manipulates her original embroideries into delightful alter-like "Spirit Houses." Found objects from earlier travels also decorate her personalized retablos and allow her mental visitation rights. The resulting dioramas are both new age art and spiritual refuge for the child in all of us. 5" x 14.5" x 11.5"
Each approx. 4.5" x 4.5" x 8.5"
26" x 5" x 4"
3.5" x 4/5" x 4/5"